How Personal Injury Cases Work in Iowa | Hupy and Abraham, S.C.
Before you file a personal injury case in Iowa, you need to know how a lawsuit works. 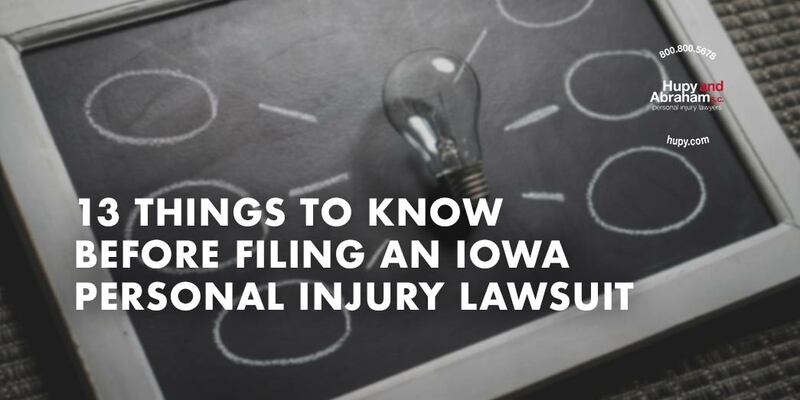 The negligence of the person who hurt you may be clear—you may know exactly what happened—but you can only recover compensation for your injuries if you follow the rules for filing a lawsuit in Iowa. The rules can be complicated and any misstep could prevent you from getting the recovery that you deserve. However, you do not need to pursue a lawsuit on your own. Instead, you can contact an experienced Iowa personal injury lawyer to represent you and help you get the recovery that you deserve. Our attorneys will explain your rights so that you understand them and fight for your fair and just recovery. If you have a case. Before you file a lawsuit, you need to know if you have a legal cause of action. If you try to file a lawsuit without a valid legal claim, then you can expect that the defendant will quickly raise that issue with the court and that your case will be dismissed without you recovering any damages. How long you have to file a lawsuit. The Iowa Statute of Limitations typically provides you with two years to file a personal injury case in court. However, there are exceptions to this general rule. Whether you have the right to file a lawsuit. Iowa law allows you to file a personal injury case if you have standing. You may have standing if you were the one injured, if you are the parent or legal guardian of someone who cannot file his own case, or if you represent the estate of someone who died. What options you have if you’ve been hurt. Generally, you have two options. You may file a lawsuit and pursue settlement negotiations or you may choose to do nothing. If you choose to do nothing, then you will not be able to recover damages for your injuries. Whether you will have to go to court. Not every case goes to court. Some cases may settle before trial. However, you should not be afraid to go to court if you have an attorney representing you. How to file a personal injury case. Your personal injury lawsuit will begin when you file a petition in an Iowa district court. The petition must include the required information, be properly filed in court, and be properly served on the defendant(s) to begin your claim. How to pick a personal injury lawyer. An Iowa personal injury attorney can help you file a lawsuit and get the recovery that you deserve. You can look to an attorney’s experience and information from previous clients, and you should also take into account your own personal feelings after meeting with an attorney. How much it costs to hire a personal injury lawyer. You don’t have to worry about the cost of hiring an attorney. Our lawyers are paid on a contingency fee basis. That means that you won’t owe us an hourly fee and instead we will be paid an agreed upon percentage of your recovery. What happens to your recovery if you were partly at fault for your injury. You may still be able to recover damages if you were partly at fault for your injury—as long as you were not primarily responsible for your injury. Your damages may be reduced by the percentage of fault attributable to you. Whether you need expert witnesses to prove your claim. Not every case needs expert witnesses, but there are some expert witnesses that can be important to your lawsuit. How to deal with insurance adjusters. It is the insurance adjuster’s job to maximize profits for the insurance company by paying you as little as possible for your claim. It is important to be aware of the insurance adjuster’s goal and to be careful in all communications with the insurance company. What you should do after you suffer a personal injury. The actions that you take after a personal injury incident could impact your recovery. Getting medical help, notifying the police or property owner of your injury, and making sure that evidence is maintained could help your claim. What mistakes you should avoid after you suffer a personal injury. Certain mistakes could cost you part of your recovery. Therefore, it is important that you be careful in all of the actions you take after an accident. This is a lot of information to take in at once, and it may seem overwhelming. Our experienced lawyers represent personal injury victims every day. We understand the serious impact your injuries have on your life and we are committed to helping you get the full and fair recovery that you deserve. Contact us online or call us directly at 800.800.5678 to schedule a meeting in any of our Iowa offices—Cedar Rapids, Des Moines, or the Quad Cities. We look forward to providing you with a free consultation at your convenience.